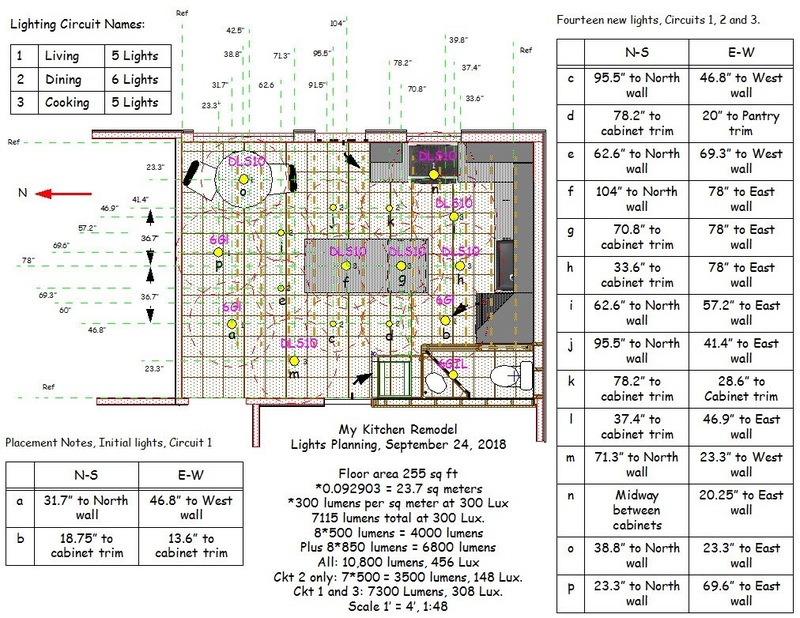 I offer a mechanical engineer and general contractor view of the evolution of imagined and commercially-offered residential LED downlighting, as seen from USA. The journey began in September 2011 with discovery of T91 in Home Depot stores. Sharing in this blog is most broadly with posts filtered by label LED Downlighting . From the beginning, my observation of possibilities has been with notion of LED overhead lighting as a starry sky . Pick that link for word search of this blog, and step back to some of the early history. I hope that in reading this post, you will come to share the starry sky notion, though it is not confirmed as publicly-accepted in a general search of LED downlighting as starry skies . I am privileged to have freedom to imagine and invent in my own home, and that invention is the subject of numerous posts, this blog, Label: My House . Appreciate the virtue of the new half-bath. To the right of the bathroom plywood gray-painted wall, see a useful pantry cabinet, separated from the bathroom by a cabinet 6" wide, housing a sturdy stepladder and an ironing board. I offer new ideas to cabinet-makers and kitchen planners, as well as to lighting shoppers. 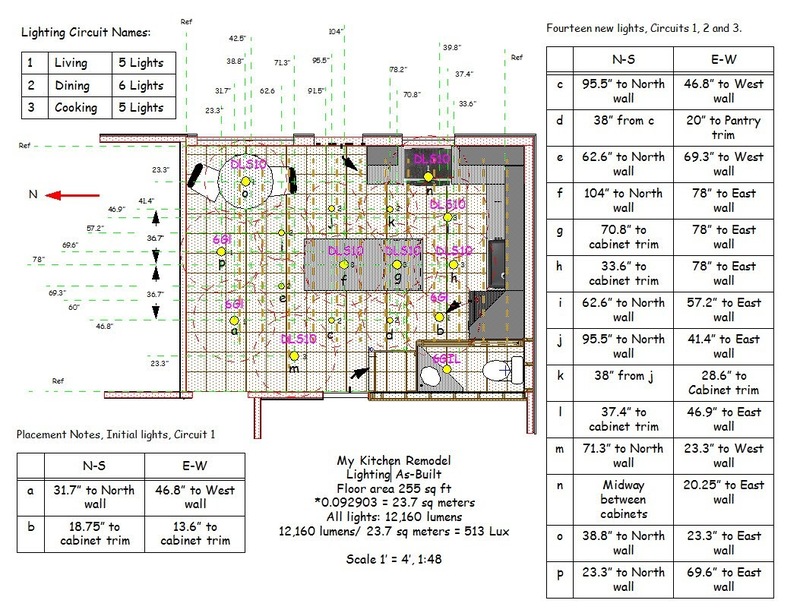 Here is my as-built lighting plan, with named lighting constellations. Of these, all are discontinued except CE 74203. The original 6" GetInLight in the bathroom is prettier and superior to an "improved" version now offered at Amazon marked "2nd Generation" on the package. My kitchen is a lighting museum documented in my blog posts and photo albums. Who else has followed the evolution, and the disappointments of marketing failure? Where else will you see those discontinued pretty, useful lights of modest glare, superior to slim pickings in what can be found today? The linked photo album includes photos of the achieved lighting, including the illustration of light groupings as constellations. In this, see that constellation make-up should consist of variety in size. Here see all lights, about 500 Lux. This is only useful light. It is easy to live under. Of best efficiency. Not glaring. See good angled ilumination of countertops without resort to difficult under-cabinet wiring. Angled lighting matters. There is always loss of luminaire efficiency where recessed in the luminaire or confined within a can. This photo accurately depicts what you would experience standing in the kitchen. You see mainly from eye level and downward, as we and all creatures are conditioned, living under the Sun. It is important that luminaires have ample diode and lens area to avoid glare. Please read more about glare, in this blog. Search Label: Luminance Definitions . Government officials: beginning with US Department of Commerce, require that packaging labels include competitive statements of diode luminance and lens luminance. Include here some practical details of the selection and installation of luminaires. With a mock-up, imagine ceiling cuts 3" diameter for the brackets and luminaire mounting of CE 74203 LED disk edge lights. I wished to find lights that demanded only minimal ceiling cuts, to pass wires. The newly-found lights from Lowe's would absolutely require 4" cuts. In fact I needed to do one installation very much like this. A 1x4 bridge of drywall edges interfered with cut-in of a junction box. Cut a 3" hole in the drywall, on the hole center, before cutting a 2 1/4" thru-hole in the 1x4. Now, is there really anything to be saved by making a smaller hole, if a sizable hole can't be avoided? I have developed the method with 3" holes, but it is simpler and more versatile to just cut in RACO 175 boxes now, as done here for light Position m.
A Nicor DLS10 LED disk light is screwed to the ceiling below this 1x4 that bridges a drywall edge. A 1/4" hole through drywall and the 1x4 passes the luminaire DC power leads. 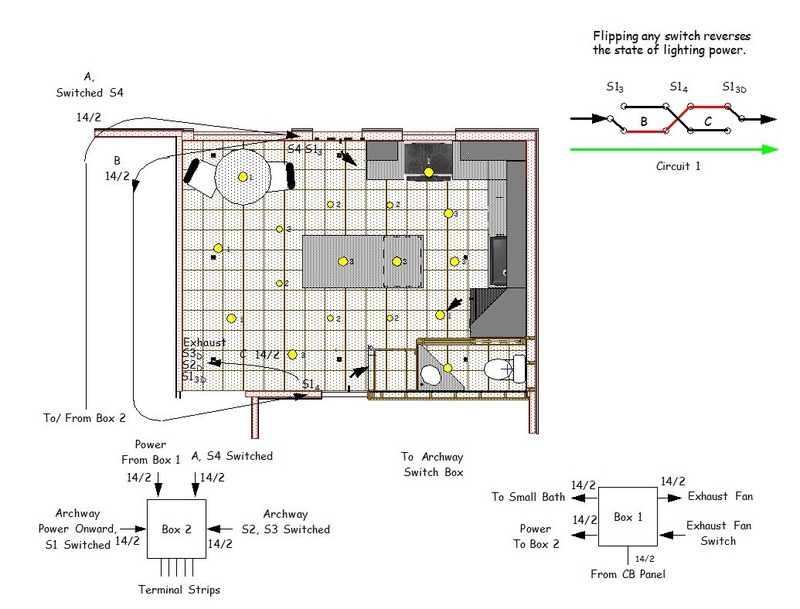 Screw-attach the converter block in the attic, and complete AC wiring connection via 18 ga 3-wire leads to the lighting distribution panel. Three lights at room center over the kitchen island are wired in this way. 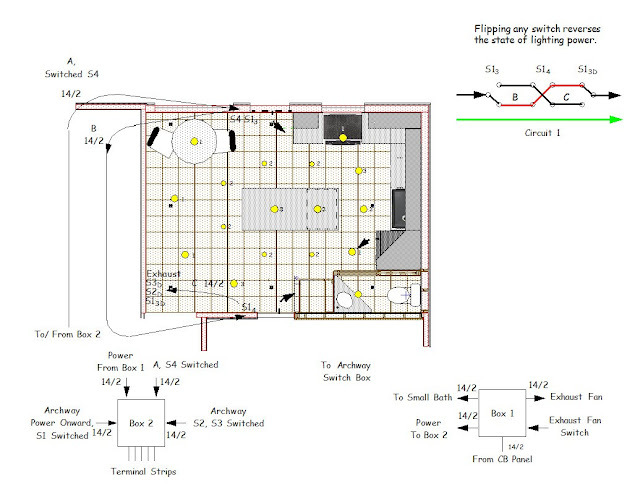 Here is my attic completion of lights wiring, Box 2 in the diagram above, and some very efficient terminal strips. One terminal strip each for circuits 1. 2 and 3, and a fourth strip for neutral wires. My home-run leads of AC power to luminaire positions is 18 ga. I hope to demonstrate that 11 watt luminaires should no longer be fed with 14 ga romex leads. The home runs sometimes miss opportunity of daisy chains, but bring flexibility of switched light groups, and are more error-free. I have no progress toward wiring of lights as DC, but think I bring fresh experience to a methods table. I will pretty up all of this wiring before moving on to other work outside my home. I have mixed feelings about not carrying ground wires to the luminaires. The green wires here serve no purpose, and I think 2-wire 18 ga wiring Black/White, is better. Manufacturers do not understand the need of luminaire grounding, often making installations more difficult and unreliable. Can we just eliminate ground wires? Pursue that decision to leave green wires not-connected. Here are the full contents of the Commercial Electric 74203 package. See a screw and a green wire in the bag. 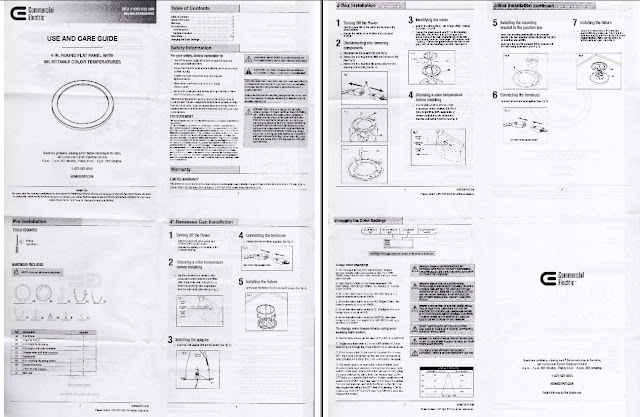 Here are the installation instructions, the two sides of one piece of paper. 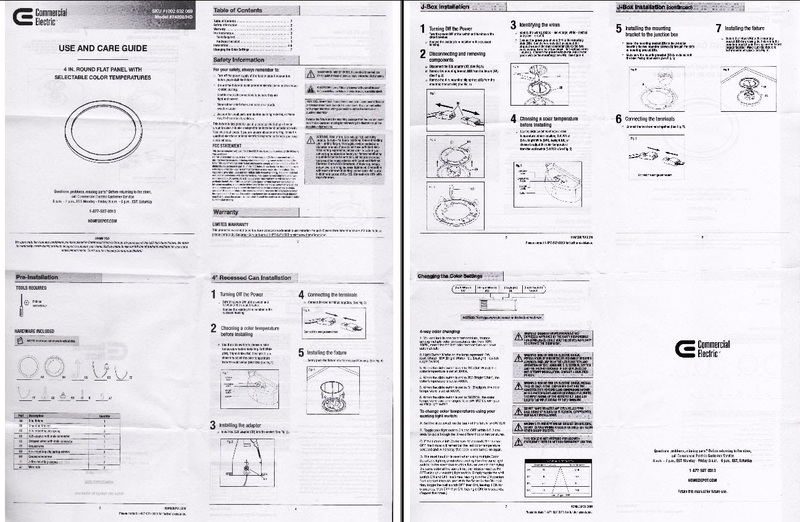 Intentions for the green wire and screw are evident in Instructions Step 3 at top of Instructions second page. It is intended that ground from the circuit breaker panel be applied to the luminaire mount ring. What does this achieve? Just that if a bared power lead touches the ring, there will be trouble. I think a principal purpose of a luminaire ground wire is to serve as an installation tether, and that is not done here. Bare copper wires connected to ground present real danger in needless proximity to AC line voltage. Ground connections to line-voltage devices in junction boxes should thus be with insulated green wire. Ground wires in line voltage cables should more-commonly be insulated. Ground wires in low-voltage cables should not be not required if serving no purpose.